To march in double time from a halt or when marching in quick time, the command is Double Time, MARCH. 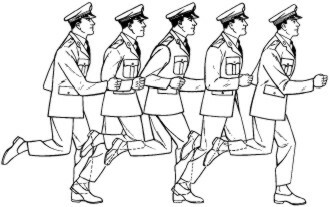 When halted and on the command MARCH, the airman begins with the left foot, raises the forearms to a horizontal position along the waistline, cups the hands with the knuckles out, and begins an easy run of 180 steps per minute with 30-inch steps, measured from heel to heel. Coordinated motion of the arms are maintained throughout. When marching in quick time and on the command MARCH (given as either foot strikes the ground), the airman takes one more step in quick time and then steps off in double time. To resume quick time from double time, the command is Quick Time, MARCH, with four steps between commands. 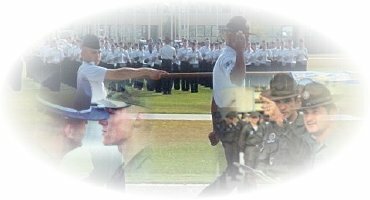 On the command MARCH (given as either foot strikes the ground), the airman advances two more steps in double time, resumes quick time, lowers the arms to the sides, and resumes coordinated armswing. To halt from double time, the command Flight, HALT is given as either foot strikes the ground, with four steps between commands. The airman will take two more steps in double time and halt in two counts at quick time, lowering the arms to the sides. The only commands that can be given while in double time are Incline To The Right (Left); Quick Time, MARCH; and Flight, HALT.